(Photo: Baptist Press / Matt Miller)Arkansas mega-church pastor Ronnie Floyd photographed after he was elected president of the Southern Baptist Convention on June 10, 2014. 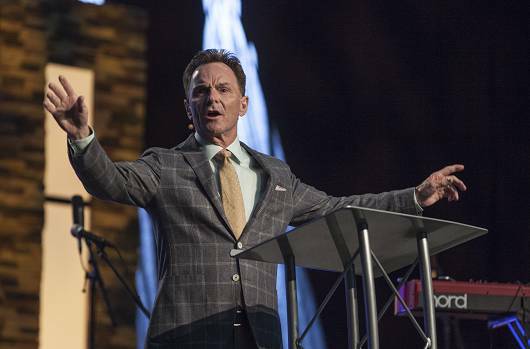 Arkansas mega-church pastor Ronnie Floyd has been elected as the Southern Baptist Convention's president as the largest Protestant denomination in the United States tries to reverse declining membership and church attendances. Floyd, pastor of Cross Church in northwest Arkansas for 27 years, topped fellow nominees Maryland pastor Dennis Manpoong Kim and Kentucky pastor Jared Moore to win the SBC post on June 10 in Baltimore, Baptist Press reported. "I want to see revival come to the church of Jesus Christ," he said after his election, "so that America would be awakened with a powerful God consciousness where great numbers come to faith and trust in Jesus Christ as Savior." Many mainline Protestant churches also report declining membership. Floyd said he will speak to Southern Baptists each Monday through a weekly blog and recount his travels on Twitter and Instagram. "Wherever I go I want to help tell the story of what God is doing across North America and the world," Floyd said. Through a Web-based relationship, he said he will call the entire denomination, which is proud of its conservative roots, to pray for spiritual awakening. More than 100 years have passed since the United States has had such an experience, he noted. The Southern Baptist Convention is the world's largest Baptist denomination with nearly 16 million members in more than 45,000 congregations as of 2012. It is the second largest Christian body in the United States, after the Catholic Church. "Southern Baptist laypeople have not accepted homosexuality as quickly as the general public, but they face strong and compelling impulses to reconsider their religious opposition," wrote Jacob Lupfer, a commentator on religion and American public life for Religion News Service. Lupfer said Southern Baptists need to do this, "from the broader culture and from their own experiences with gay co-workers, neighbors and relatives who do not seem like especially vile sinners living in defiant rebellion against God." The new SBC president succeeds New Orleans pastor Fred Luter of Franklin Avenue Baptist Church, who became the first African American to lead the SBC when he was elected in 2012. Floyd has been a key organizer of two pastor/leader prayer gatherings that each drew participants from nearly 30 states during the past year, in Atlanta attended by 400 pastors and in the Dallas-Fort Worth area attended by more than 175 pastors. Floyd also has served as general editor for the updated version of Bible Studies for Life, the popular Bible study curriculum produced by LifeWay Christian Resources. He led an advisory team of pastors and ministry leaders to help design the new material from a church perspective. Floyd also serves as lead pastor and strategist with the North American Mission Board for its Send North America church planting strategy and is the author of 10 books, including "Our Last Great Hope: Awakening the Great Commission" (2011). He holds doctor of ministry and master of divinity degrees from Southwestern Baptist Theological Seminary in Texas and an undergraduate degree from Howard Payne University, also in Texas. Threats to religious freedom were discussed before the convention reported Baptist Press and commented upon by Baptist theologian Russell D, Moore in a panel sponsored by the SBC's Ethics & Religious Liberty Commission. Moore said American Christians' recognition of the threat to religious freedom means they not only may be persecuted but they may be culpable as persecutors. Rick Warren, David Platt and Samuel Rodriguez joined Moore, the ERLC's president, in addressing June 9 the current status and future of religious freedom in the United States. Many Christians "shrug off" the issue because they don't understand they are accountable for religious liberty in the American form of government, Moore said. "And so if we shrug this off, what we're doing is we're consigning future generations, we're consigning people's consciences to a tyranny that we are going to be held accountable for." Are US churches following European churches in their dwindling attendance?